Orange County’s Favorite Dining Event Returns! It only happens once a year, get ready to eat well! WHAT: The Orange County Restaurant Association’s annual culinary event, Orange County Restaurant Week, begins this Sunday, February 26th through Saturday, March 3rd, with 100 participating restaurants from across the county, ranging from upscale and fine dining, to casual and family friendly establishments. During the week-long event, the eateries will offer special multi-course menus within three price categories: Lunch for $10, $15 or $20, and Dinner for $20, $30 or $40. Each restaurant will have the freedom and flexibility to showcase its best offerings by talented chefs who will, no doubt, personalize each menu to reflect their culinary style. You can search restaurants by location and price point, as well as make reservations online at www.OrangeCountyRestaurantWeek.com. WHERE: At 100 participating restaurants throughout the county, for menus, address and other details visit the Orange County Restaurant Week website. There’s also a very cool map of all Restaurant Week locations on Block Beacon. WHO: In addition to the many restaurants involved with making this event a tremendous success, 2012 Orange County Restaurant Week presenting sponsors include Newport Beach Lexus, Orange Coast Magazine, OCMetro, Socal PBS, Playlist 92.7, Moxxe PR, LA Times, Cox Media, Dining with Dills, and Yelp. Additional sponsors include OCStandard.com, Edible Orange County, Your Restaurant Connection, Dining Out, Rage Magazine, GreersOC.com, OCWeekly, AnaheimOC.org, TravelZoo, OpenTable, Block Beacon, Cathy Thomas Cooks, Temecula Wine Growers Association, Infinity Menu and OCfoodies. 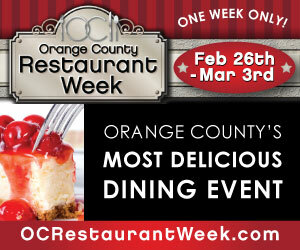 For general information, or to learn about participation or sponsorship opportunities during Orange County Restaurant Week, please visit www.OrangeCountyRestaurantWeek.com. To learn about or join the Orange County Restaurant Association, visit www.OCRestaurantAssociation.org. I did not realize its OC restaurant week! I must visit. I hope you will be posting about some of the restaurants you try out! I wish I lived in the OC to enjoy this, but since I don’t – I also hope you’ll be posting about some of these restaurants. I love your write-ups on restaurants! One of the best events!